EN-V, which is short for Electric Networked-Vehicle, maintains the core principle of personal mobility — freedom — while helping remove the motor vehicle from the environmental debate and redefining design leadership. EN-V is a two-seat electric vehicle that was designed to alleviate concerns surrounding traffic congestion, parking availability, air quality and affordability for tomorrow’s cities. In the year 2025, your car will think faster, drive better and be nearly indestructible. Cars will tell the difference between a person and a road sign and brake accordingly. Magnesium outer shells will be nigh-indestructible. And you might not even have to drive at all — a robot will do the driving for you. You ease into a passing lane and wave to a nearby driver. As you approach 100 mph, you take out the morning paper and pour a cup of coffee, your vehicle locked to a wireless signal and driving itself. This signal — prevalent across the U.S. — determines your speed and that of other drivers. Outfitted with HDTV, a 3-D display that emits out the windshield and hovers above the hood, and windows that tint based on the weather, you’re riding in style and comfort, never worrying about an accident, thanks to the car’s bulletproof magnesium shell. Sound far-fetched? For the $275 billion auto industry, it’s the future. By sheer innovation, car companies such as GM, Mercedes, and Ford are hoping to make fatalities and congestion distant memories. And the government is already intent on building an infrastructure to make autonomous driving possible, encourage new safety advancements, and maybe revive the industry. “It’s impossible to single out the one best car technology,” says Steve Choman, a research analyst with Databeans. He cites the abundance of eye-popping existing tech as evidence of an imminent car tech revolution. Self-parking vehicles, night-vision systems and traffic-sign recognition are signs that a new tech era for the auto is coming — not to mention seats that give you a massage. During a recent visit to Detroit, it was obvious that the auto industry has innovation up its sleeves. Many ideas I saw there will be standard on vehicles in the next two years. Ford’s MyTouch system, for example, will debut in the 2011 Ford Edge; it provides a 4.7-inch, touch-enabled screen to let you control navigation, media, and the in-car temperature. MyTouch accepts plug-in broadband cards like those from Sprint and Verizon and shares that Internet link with the laptops of any passengers. Yes, your car will be a roving hotspot in the future. The AppLink service will debut with the Ford Fiesta later this summer. It lets you access apps on your iPhone, Android or BlackBerry: Run the Pandora music application off your phone to play a custom radio station in your car. Or using the OpenBeak application, you can listen to Twitter messages through your stereo. While the new Ford Fiesta will hit the road in about a month, any driver will be able to add the AppLink service by downloading it from the Web and installing it on their car from a USB thumbdrive. This ability to add features to a car points to a day when drivers can customize their car’s interface and add new functions at will. I also visited the Chrysler Electromagnetic Compatibility (EMC) lab, where engineers test just about every conceivable radio signal, from Wi-Fi to GPS, to make sure all of the in-car systems work correctly. In one recent test, technicians found that turning the wheel on a Jeep Cherokee caused interference with the AM radio. . Such radio testing is especially important since the Department of Transportation announced that a new 5.9-GHz radio signal will help cars communicate with each other and the roadway. “The FCC allocated 75 megahertz within the 5.9-gigahertz spectrum for the primary purpose of improving transportation safety,” says Peter Appel, an administrator for the Research and Innovative Technology Administration at the DOT. He says the new radio signal will help drivers plan their routes, find parking spaces and adjust their driving habits based on real-time fuel-efficiency feedback. The technology in cars today is jaw-dropping, but car makers want to go even further. Perhaps the most prescient example of future car technology is the GM EN-V concept car (pictured above). Last week, I drove two of these vehicles — one of only three people outside of GM given the privilege. 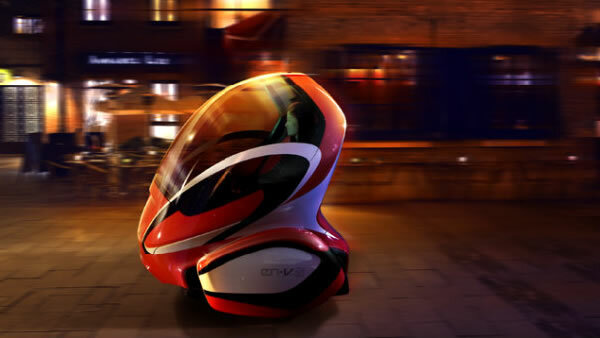 The EN-V is made of carbon fiber and uses a Segway motor that balances on two wheels. To drive forward, you push on a control screen akin to a Playstation or Xbox 360 controller — a small screen shows you your current speed and outside weather conditions. The EN-V can also drive in autonomous mode following a scripted route — say, to the local park. In the future, you could program a route in Google Maps and even send your kids off to school in an EN-V, sans a driver. Clay Dean, a GM director of advanced design who heads the EN-V design program, says the materials used on the EN-V can be easily customized. He envisions a day when drivers could come up with their own color scheme and even put one together in their garage. “You could design an EN-V that mimics your own head or a favorite sports team,” says Dean. The EN-V’s top speed is only about 17 mph, but that’s actually faster than the 8 mph at which the average commuter cruises in downtown New York. Someday, a driver could push a button in an EN-V to dim the windows, sit back and watch a holographic movie displayed in front of the car. The EN-V uses Appel’s 5.9-GHz wireless network, too. With that spectrum, the EN-V will communicate its location to other cars of the future, and hopefully help prevent accidents. Stephanie Brinley, an auto analyst with Auto Pacific, says many car makers are focused on lab innovations related to fuel economy and safety. Both Ford and GM are working on all-electric vehicles, for example. The Ford Fusion electric will likely go on sale later next year, and the 2011 Chevy Volt will launch later this year. Sherif Marakby, the director of Electrification Engineering at Ford, says the company is spending a lot of its research and development dollars on plug-in electric vehicles such as a Ford Escape concept I saw. Ford has brought battery technology development in house — setting up a new car motor group that will figure out how to make electrics and hybrids last longer. “My goal is to improve this technology to where it makes sense for any customer to buy these cars at the right price,” says Marakby, who explained to FoxNews.com the real challenge for all car makers: they compete with their own gas engine models. Every car company is coming up with new ideas to draw attention to their brand. The truly remarkable fact to hit me from several days of road tests: the future car is slowly becoming a reality. Lane-departure warning systems, adaptive cruise control, head-up holographic displays — they all point to a day when the car is intelligent enough to see imminent disaster and avoid collision, to mark out a route for you … and ultimately to take the steering wheel.